ABOVE: An older, open-bow No. 1 vaporetto approaches Venice's Santa Lucia railroad station. Click the thumbnails to see the full-size photos with descriptions and sightseeing tips. Click the thumbnail photo or text link below to open a page where you can hear a sound recording of a vaporetto arriving at a station. 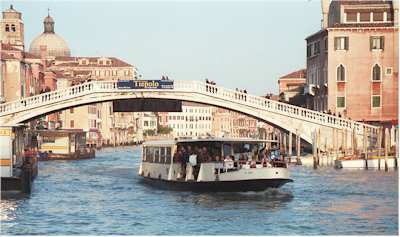 This article has up-to-date information on vaporetti, water taxis, gondolas, and traghetti. It includes prices for waterbus tickets and tourist discount passes, and it has a link to an official map of vaporetto routes. Venice's waterbus system is more Byzantine than St. Mark's Cathedral. This article and route table will make the vaporetti less confusing. Also see our Vaporetto and Bus Fares article.